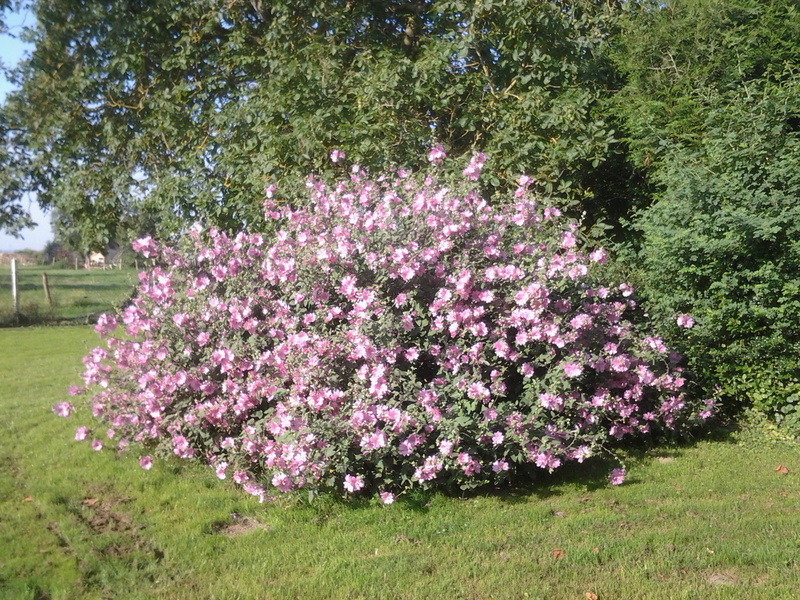 I just had to post this image here this morning : This Lavatera bush is in the back of our garden. It was a very woody, ugly cutting that I shoved into this bit of border, not really knowing what else to do with it. I realized fairly early on in the Spring that it looked laden with buds and had hopes for a full bloom, but this has gone beyond all expectations. One month ago, we held a mega-party for the kids’ birthdays (18 and 20 years old) and in the weeks running up to the party, we were hoping the bush would burst into bloom in time for the birthday weekend. It did just that, and here, one month on, it is still going strong, hence the title of this blogpost. It is absolutely splendid and ticks so many boxes on so many levels. To start with, it is truly beautiful, it has to be said. It has been this way for a month now and shows no sign of stopping, so it gives a huge swash of colour to a whole corner of the garden. Behind this bush is our compost heap, so that is hidden completely from view. 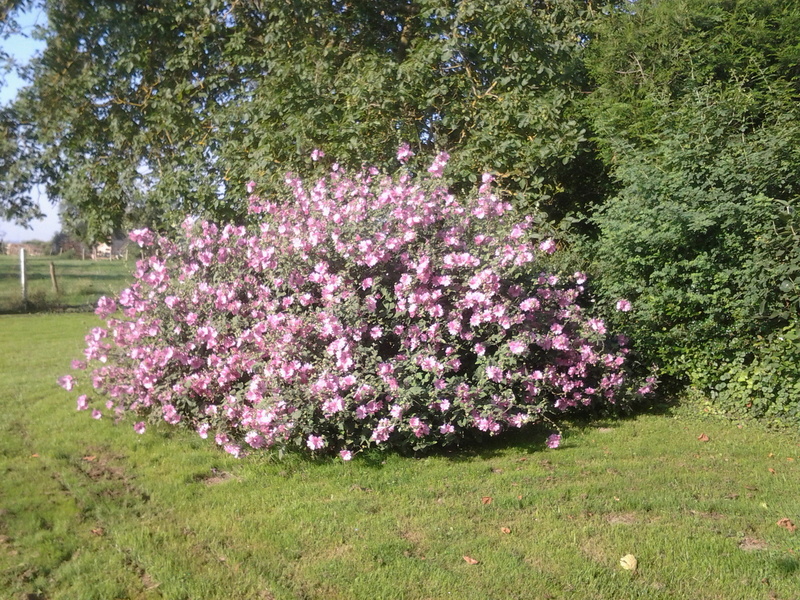 The bush is planted in a flower bed that I would normally be thinking about weeding. To be honest, even if there are any weeds in there, we certainly can’t see them and so, I don’t worry about them !! The bush has spread out so far that it has reduced the mowing surface of the lawn, which has to be a good thing !! Less mowing to do !! And finally, this very bush was actually a cutting that I took from another one, so I am going to be taking cuttings from this beauty to share around friends over the next few months, so if you like the look of this, let me know and I’ll pop a cutting in for you too !! Whenever I look out of the back window and see this sight, it brings a smile to my face as it is simply so lovely ! And of course, a lot of people know about my penchant for the colour PINK !! This entry was posted in Nothing much and tagged pink, plants, summer by Jenny Léger. Bookmark the permalink.